It was also once called Georgetown and Johannesburg Extension, but I didn’t want to push my luck adding this to the title. This ‘blink and you’ll miss it’ suburb is wedged between Jeppestown on the south and Troyeville on the north and if travelling east along Commissioner Street is what you pass through before entering Kensington. One would be forgiven for thinking it was just part of Jeppe. Interesting to note on the main picture above: Commissioner Street abruptly ends and becomes a series of veld tracks. In the background to the left is Kensington sanatorium. Also note the Don Building on the bottom right which still stands today (pictures further down). George E. Fawcus got permission from the government in 1889 to lay out a township. In 1891 he applied to have it cancelled as he couldn’t afford to pay the stand licence. This was granted and the area became a public digging which didn’t suit those that had already built their homes and were living n the area. Fawcus went to the mining commissioner for help who then refused to renew the licenses of the prospectors (that had already pegged 23 claims on the land. 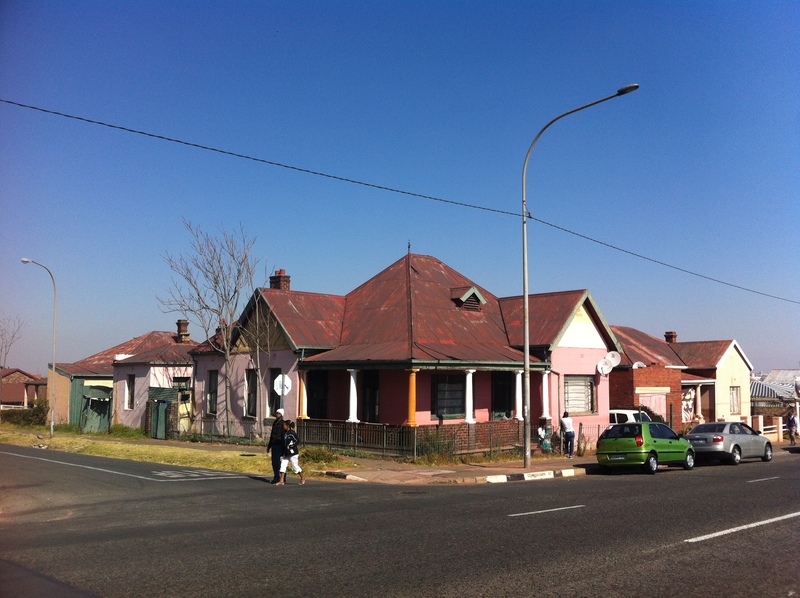 As the government had made a mistake by not de-proclaiming the residential area, Fawcus sued ZAR. On the 16 April 1895 the court fined the government. Early in 1896 the area was surveyed again and the original owners were given their sites back. In November of the same year the rest of the stands went up for sale advertised as ‘the last opportunity of buying stands in what is known as the town of Johannesburg’. George Kent, once a part owner due to the previously mentioned digging claims, named the township Fairview. It was still referred to as ‘Fawcus’ well into the 1920s. 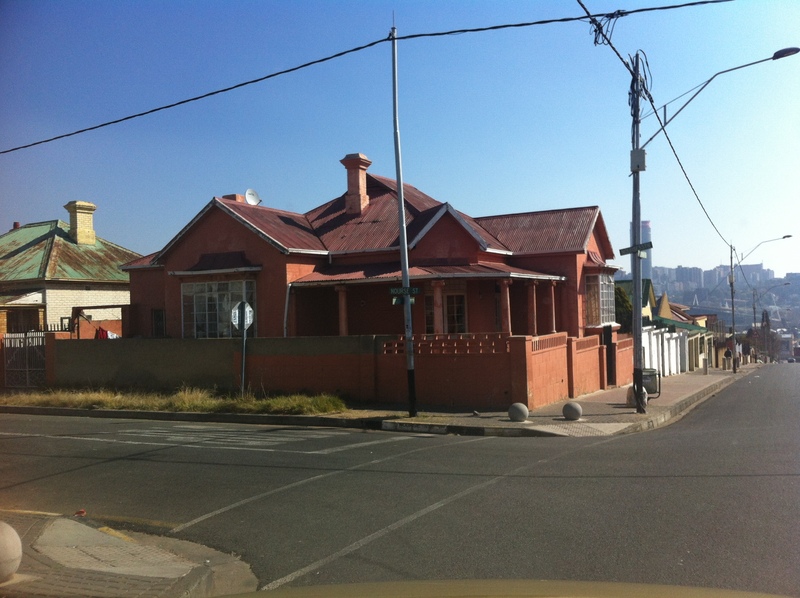 Fawcus lived in Jeppestown and once he had made enough money out of Fairview, he retired with his family to Trinidad where he died a few years later. His wife returned in 1912 and lived in a house she already owned in Fairview. She, along with G. A. Leyd’s wife, also tried unsuccessfully to change the name to Fawcus Township. It developed in to a good middle-class suburb popular with miners. 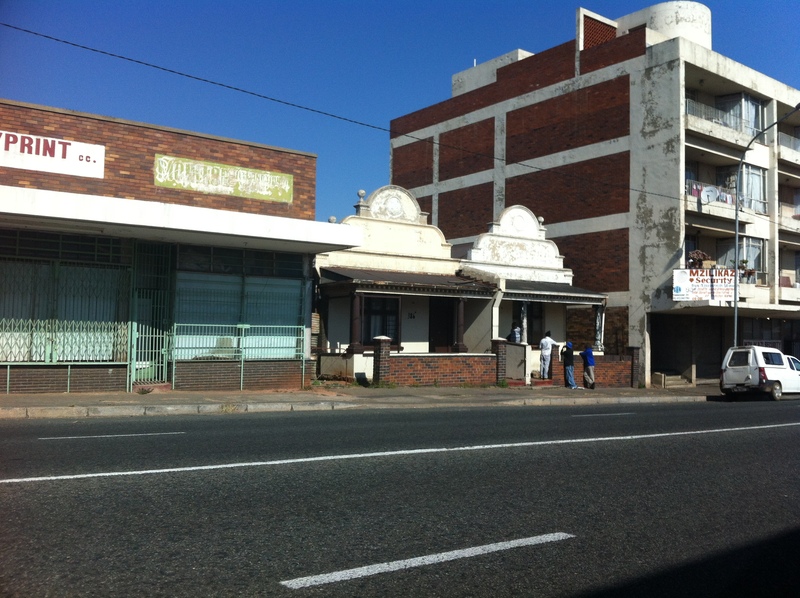 Over the years, like other suburbs close to the city, light industry infiltrated, especially along Commissioner Street, and the suburb generally slipped to sub-economic level. 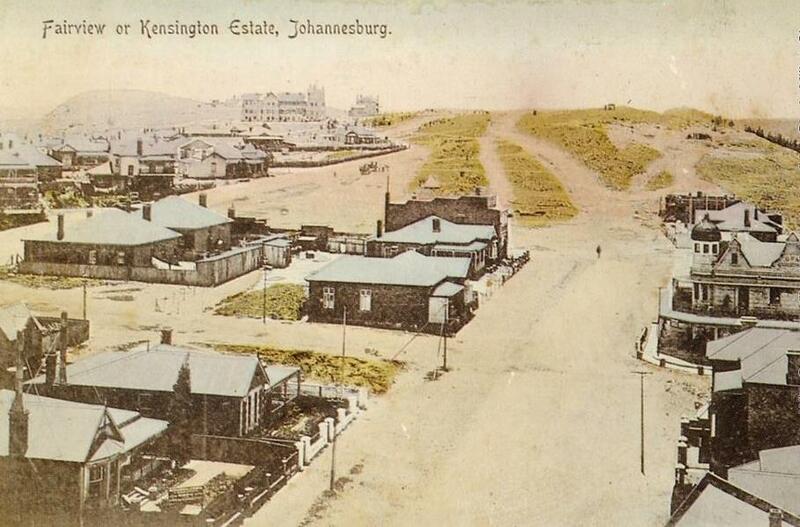 Unlike its neighbours Kensington, Belgravia and Jeppestown: Fairview was never planted with trees giving it a bare appearance. 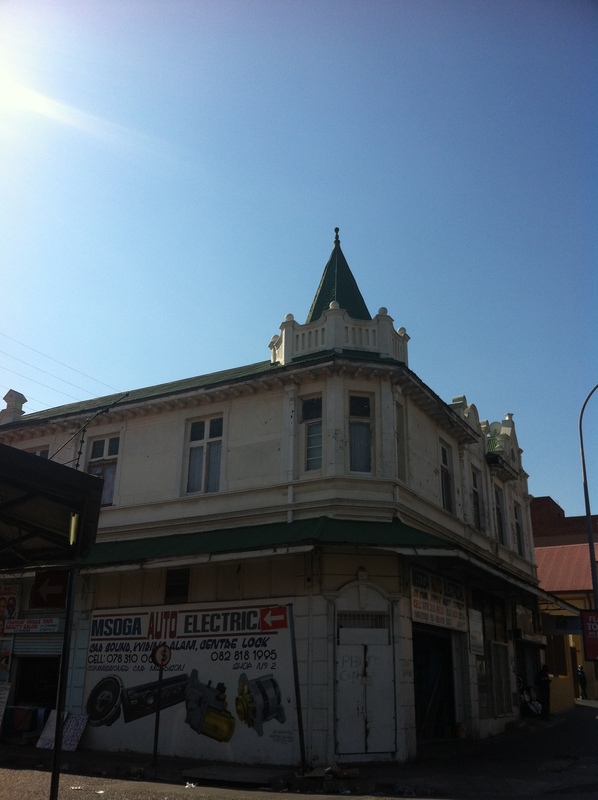 Although a small suburb, there are a few significant examples of architecture. 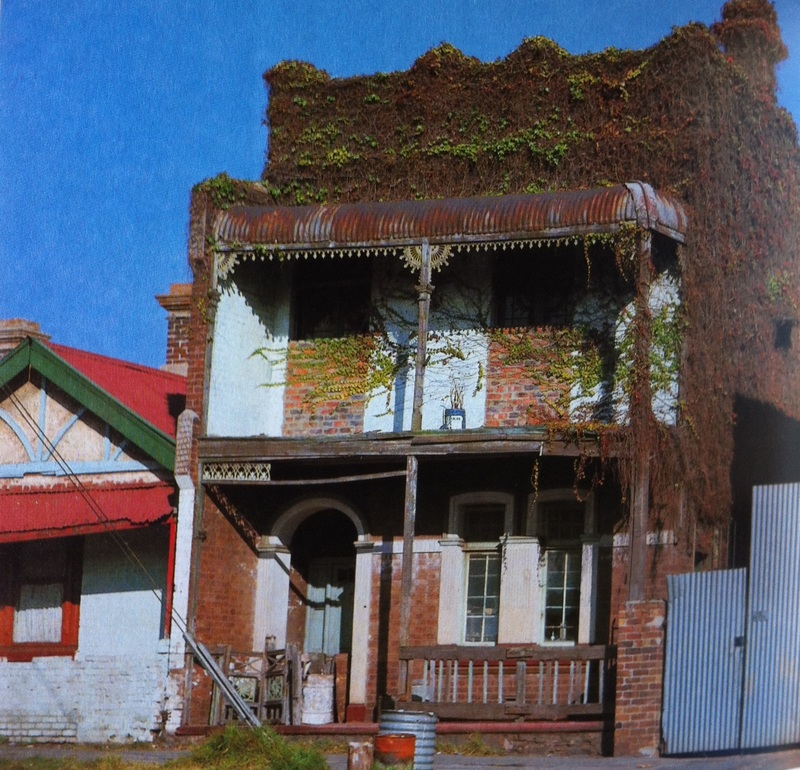 I’ve included a few examples of houses at the bottom end on Op De Bergen street which could also technically form part of Troyeville. It differs depending on the reference, but I have left the balance of Op De Bergen street for the Troyeville post. It’s possible that the one side of Op De Bergen Street falls under Fairwiev and the other under Troyeville. 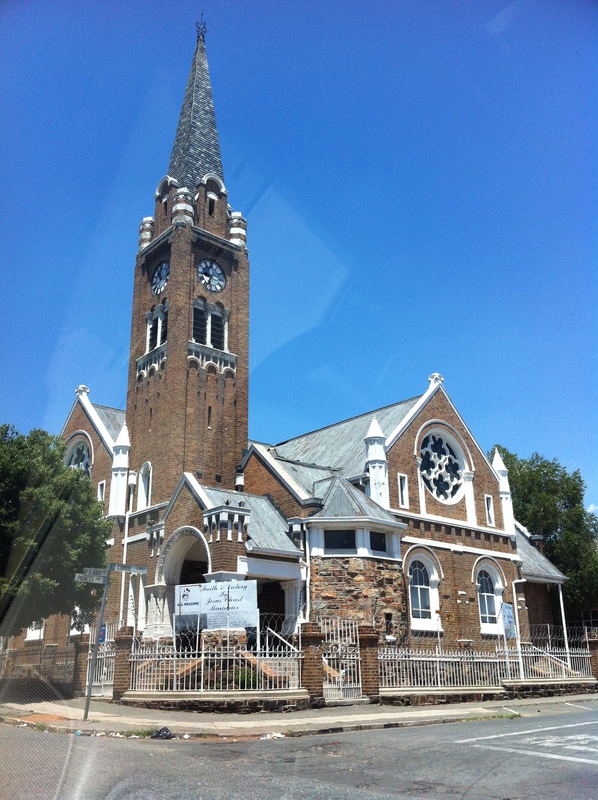 The cornerstone of the church was laid by General J. H. de la Rey on 2 May 1906 and was inaugurated on 26 January 1907. Kallenbach & Reynolds prepared the plans. 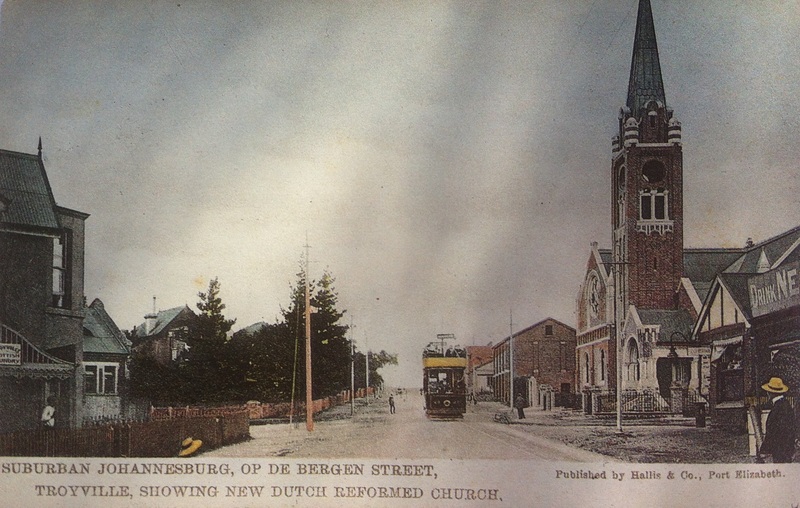 Kallenbach, who settled in Johannesburg in 1896 designed several churches. This church was designed in the shape of a Greek cross to suit the square dimensions of the plot of land. The use of arched windows points to Romanesque revival of the late 19th century, while the white plaster accents around the windows and gables is Victorian. 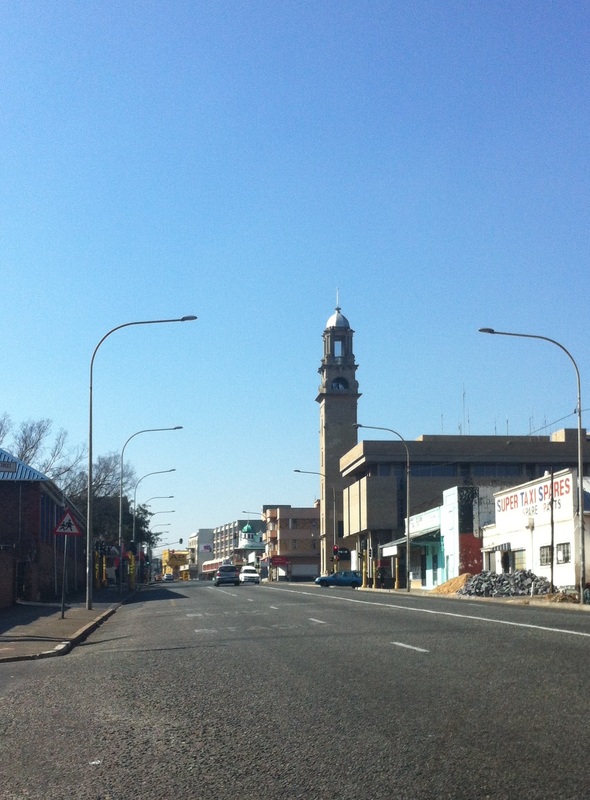 The ‘pencil point’ tower is an early example of a typical South African steeple and a feature of many churches built right up to the 1960s. The church was renovated in the 1960s and declared a national monument on 9 March 1973. Frizelle House was once the home of master plumber Sam Frizelle. His business was run out of the house next door. 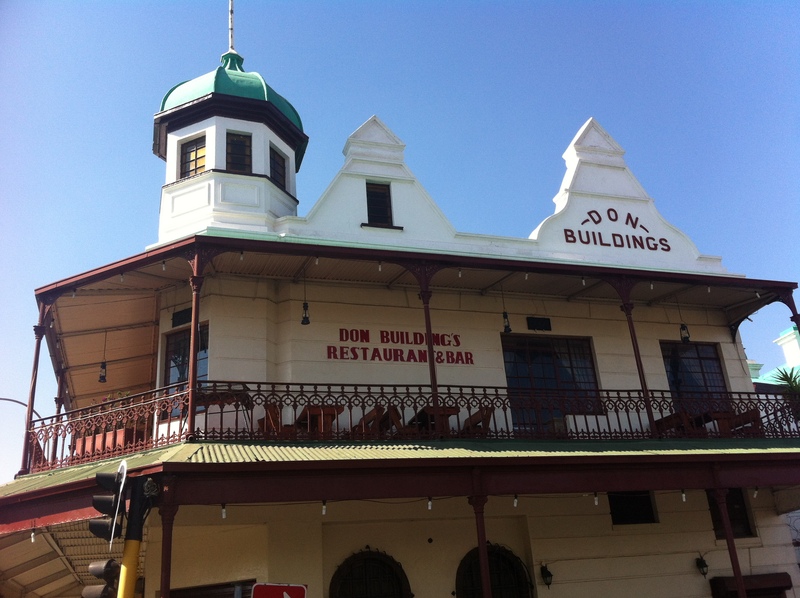 He came to SA just before the Anglo-Boer War and with his son and partner formed a business called Frizelle & Welch. The house (which once had striking cast-iron railings) is severely neglected. 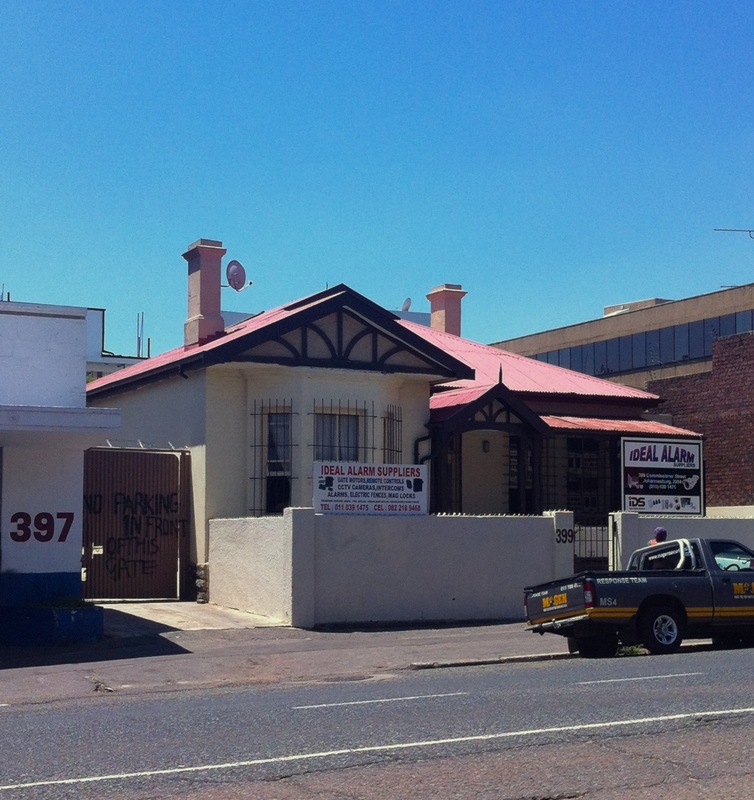 The semis next door are very much British Colonial (pitched roof, decorative gables) with a hint of Karoo Afrikaans (curved corrugated iron awnings supported by pillars). Any hopes of restoration are lost. The balconies are gone and a new facade/plastering arrangement has taken its place. The house is right at the bottom end of Op De Bergen street where many of the remaining houses are sadly in poor condition. The Don building housed the original Gray & Smith grocery store. Today it’s still in pretty good condition and is a restaurant. 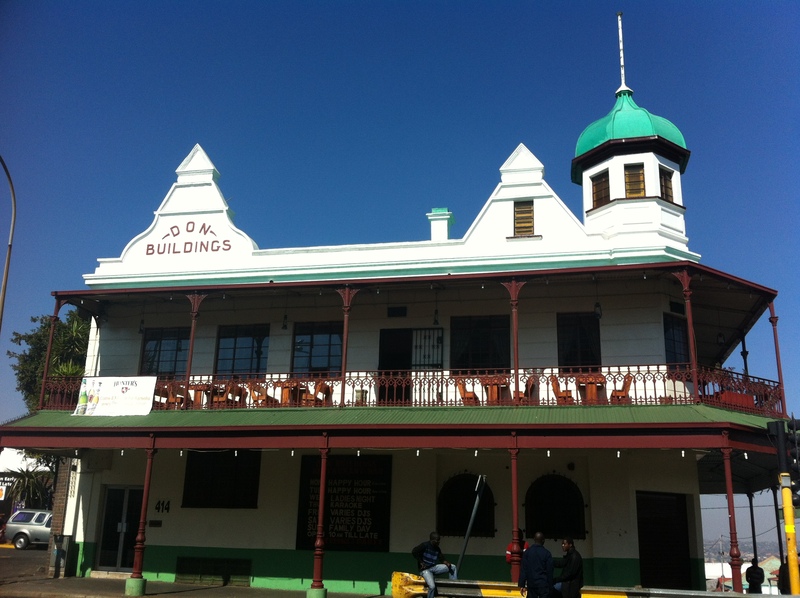 Johannesburg’s first fire station was completed on this site in 1906. The thirty-five metre tower was used as a lookout for spotting fires before the advent of telecommunications and also for drying out fire hoses which were hung in the tower. When the station was re-built in the early 1980s, only the watchtower was kept. 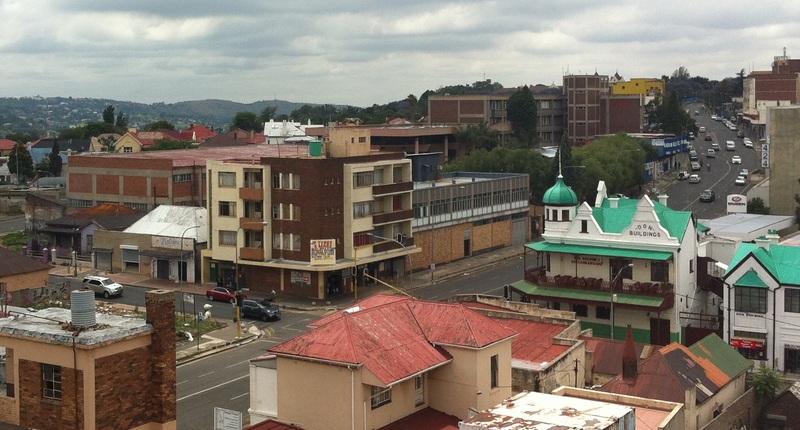 It is Johannesburg’s only remaining fire tower and the highest of a group of towers in the area. Info from http://www.blueplaques.co.za. Further research shows that this may be the same fire station referred to as the ‘Eastern District Fire Station’ which was designed by David Ivor Lewis. 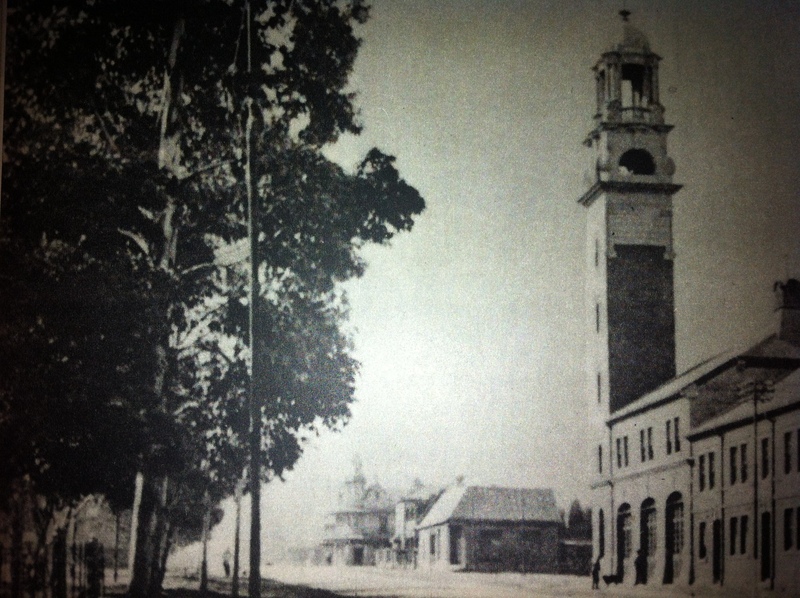 Julius Jeppe laid the foundation stone in 1905 and the tower is a protected national monument today. 22 Nov	This entry was published on November 22, 2013 at 9:45 pm. 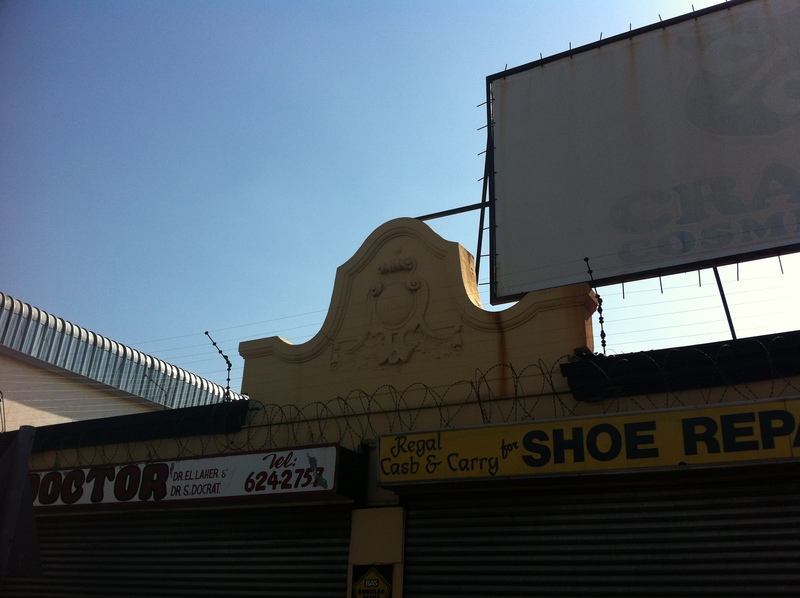 It’s filed under Johannesburg and tagged church, Commissioner Street, Early Johannesburg, Fairview, Fire Station, fire tower, history of johannesburg, Julius Jeppe, Kallenbach, Op De Bergen Street. Bookmark the permalink. Follow any comments here with the RSS feed for this post. I love your site, Great job! Can’t you perhaps do more research on Faiview, eg, the street where the notorious Foster lived with his parents, photos of side streets, such as, Gus, Janie, Hans, Corrie, Browning, Crown and Grace. 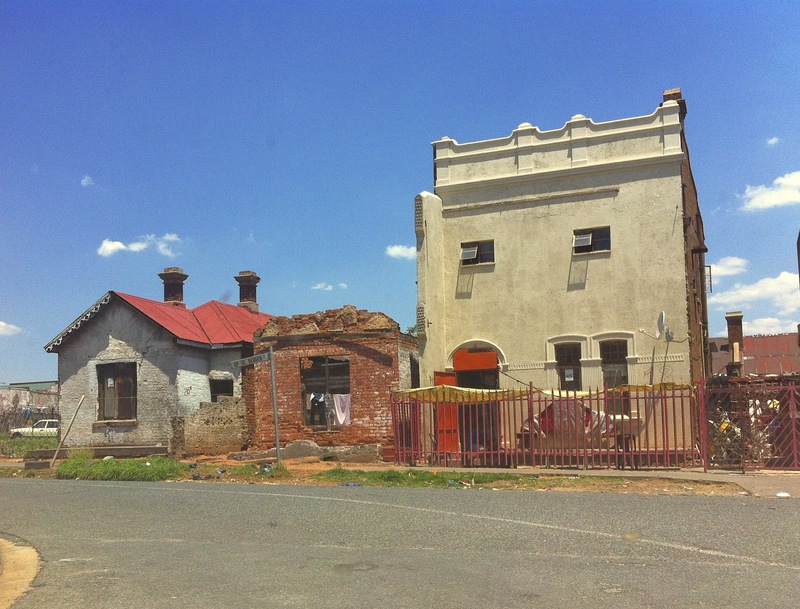 The Jeppe Station, etc. 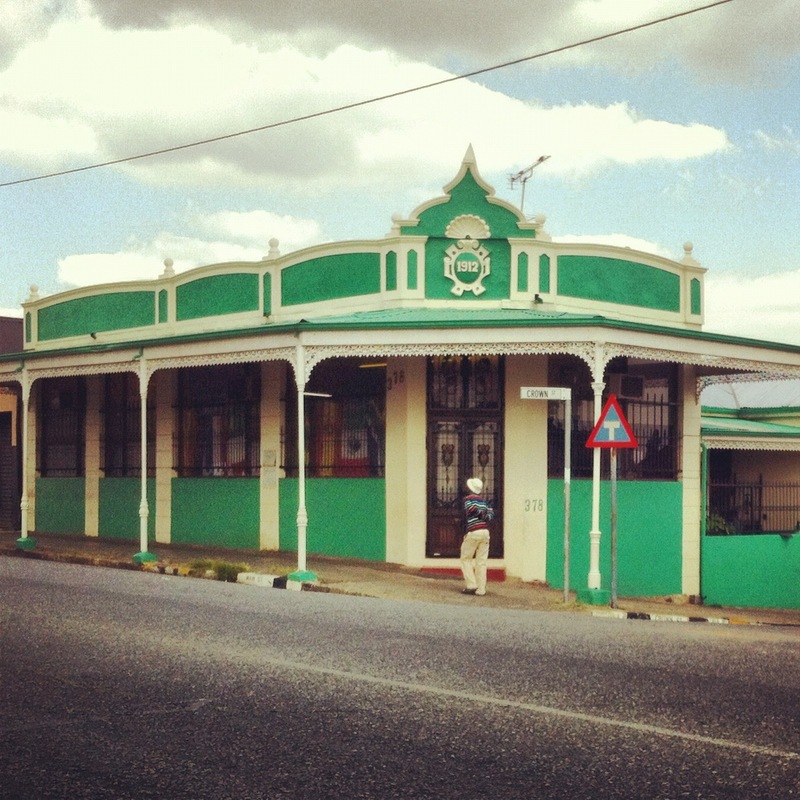 I grew up in Faiview, and now live in Stilbaai Western Cape. Thanks for reading. Will do! I add to older posts regularly as I find more information or photos and will look into your suggestions. I’m busy with Braamfontein at the moment so give me a few weeks. Best wishes with your trip into nostalgia and older memories. your site is very interesting. As a child I was a fairly frequent visitor to two Fairview houses at the top of Appolonia Street, numbers ten and twelve. I liked walking past the firestation and recall the tower there with its angled flagpoles (I presume) very well. I have no photographs sadly, but the interiors of those two houses if one could see them as they were into the 1960’s would today leave one gasping at the craftmanship and especially the woodwork. The doors were solid with generous mouldings surrounding the panels, the fireplaces were surrounded by elaborate mantlepieces, wooden floors throughout with magnificent deep and moulded skirting. The doors all had brass finger plates above porcelain knobs and the keyholes also in brass had metal swing covers. There was a quite a lot of coloured stained glass in a geometric pattern (leadlight) above the twin wooden French doors leading out into the small garden off the diningroom at number ten. There was stained glass surrounding the rather elaborate and solid front door too. The interior had a certain grandeur, peacefulness and yet a clam and cosy feeling to it. Outside off the front of the tiled verandah one can presumably still look across the “Bez. Valley” and see the skyscrapers of Hillbrow looming upwards rather like a mountain range. 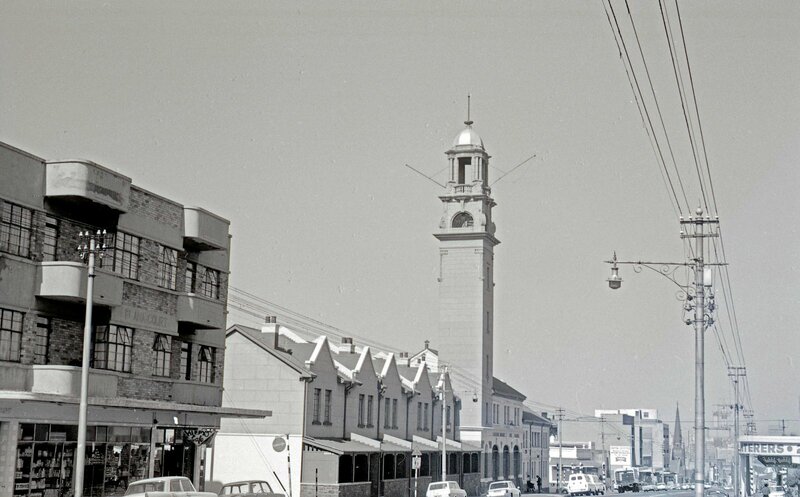 Ponte was not there in those days, but the “Hillbrow tower” was quite new. I will not disclose any names publically but the father of the lady who lived with her husband and only daughter at number twelve was a master carpenter employed at Shepherd and Barker and the pride of the diningroom at number twelve was an enormous diningroom table that could seat about twelve people with matching carved chairs made by him. Hi Patrick, Thanks for sharing your memories. I did a piece on the area around Ponte and there is a picture of the land before it was built. Pity I don’t have a skyline shot…Having only been born in 1973, I’ve always known it to be there. reality check am sure. Keep in contact. I enjoyed reading. I grew on the same block as Frizelle and Welsh .28A Op De Bergan Street. walked passed it every day.from the age of 5.Most wonderful memories of my child hood.I knew all the areas that you mentioned so well.We walked everywhere we went those days. Thanks for your sharing your memories Carol!